Cornerstone is located in Didcot's town square. Our postal address is below but if you are driving to Cornerstone using a sat nav, please use the postcodes provided in the parking section below. Cornerstone has no direct road access. Click here to find us on Google Maps. Cornerstone is very easy to access if you are local. We are situated in a pedestrianised area and we encourage you to walk or cycle if you can! Didcot is accessible via the A34, A417 and A4130. The M40 is around 30 minutes away and the M4 just 20 minutes away (traffic permitting). Long stay parking - next to Orchard Centre car park (just off Hitchcock Way next to Sainsbury's) and Didcot Parkway train station. Disabled parking is available at the top of Station Road, next to the Cineworld cinema, in front of Boots the chemist on Broadway and in the Edinburgh Drive car park. 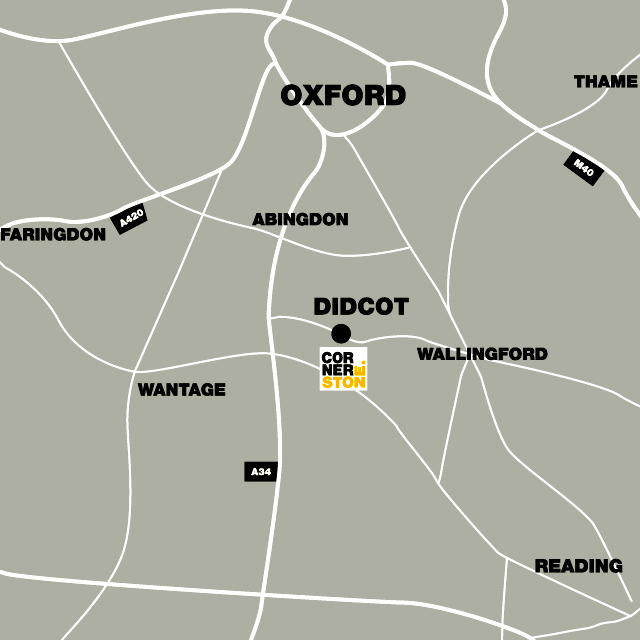 We are just seven minutes walk away from Didcot Parkway train station. Trains run from Didcot Parkway to Reading, London Paddington, Oxford, Bristol and beyond. There are also four bus stops within walking distance. Services are operated by Thames Travel, RH Transport, Oxford Bus Company, Heyfordian and Whites. When making deliveries, please call in advance and use the postcode given by the Duty Manager. For places to stay in and around Didcot, check HotelsCombined.